Disney's animation department is no stranger to darkness. From their foreboding presentation of a wart-laden, apple-poisoning queen in Snow White to the young boy who transforms into a donkey in Pinocchio, they've flashed at least modest amounts of morbidity in their otherwise family-friendly fairy tales since the '30s. But they've always been about striking a balance, countering the sinister bits with splashes of vibrant magic into something ... well, magical. 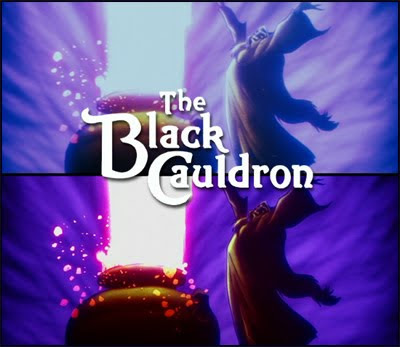 That's where The Black Cauldron, directors Ted Berman and Richard Rich's adaptation of Lloyd Alexander's "Chronicles of Prydian" books, tests the animation house's threshold in presenting dark material by using elements that range from resurrected skeletons to torture and suicide. Disney's costly, bizarre black sheep really could've achieved more than its cult stature, had it reached beyond simply being a gloomy blend of its other productions. Still, though far from being a forgotten classic as it struggles to find an audience, there's something undeniably compelling about The Black Cauldron. Check out the full review, including a series of comparison screen captures between the old and new DVD, over at DVDTalk (link).